Dental Ultrasonic Cleaners – ESMA, Inc. These waves create bubbles that agitate the surface of the dentures and thoroughly clean every crack and crevice to ensure that they are cleaner than they ever would be if someone were to attempt to clean them by hand. This convenient and efficient process is especially useful for anyone who wears dentures on a daily basis and wants to be sure that they are clean before and after each use. A dental ultrasonic cleaner can also be found in a dentist’s office where dental hygienists make use of the technology to clean tools and components used in their practice. The cleaner allows them to quickly clean instruments, but a spray form of the ultrasonic cleaner can even be used to clean the teeth of patients. An ultrasonic tooth scaler emits cleaning solution that has been agitated by high-frequency waves. This solution cleans the patient’s teeth when it comes into contact with them by removing any plaque or buildup that may be resting on the surface or caught in the small space between the teeth. The energy exerted by the dental ultrasonic cleaner can remove any particles that might be stuck. Water is used as a coolant so that the solution does not bother the patient’s teeth, and the experience can be much more pleasant than the traditional method of plucking away at plaque using sharp metal instruments. Many companies that manufacture large ultrasonic cleaners for industrial use also manufacture these small dental ultrasonic cleaners for sale to clients in the dental supply industry. 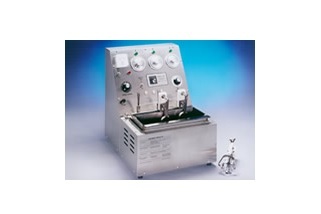 The basic principles used in a dental ultrasonic cleaner are the same as the ones used in any ultrasonic cleaner. A solution that is developed specifically for use in dental applications is used with the ultrasonic cleaner. This solution is required to maintain the appropriate PH levels and protect the patient from being exposed to any harmful chemicals while his/her teeth are being cleaned. Dental Ultrasonic Cleaners A dental ultrasonic cleaner is a small machine that is used to clean dentures using the high-frequency waves generated by an ultrasonic cleaning solution.